The chickens have stripped their pen into a bare lot. Obviously, thats not very good for it. Since we haven’t gotten the rest of our property fenced yet I can’t let them out into the pastures. Even if I wanted to I wouldn’t because we have a lot of neighbors that don’t keep their dogs contained. I have no desire to start loosing chickens to the dogs just so I can free range the hens a little better. I have noticed that they have started eating more of their food again since there isn’t as much to eat on in the pen. The only other place that has a complete fence around it at the moment is our vegetable garden. I only have garlic in there right now. So I have been carrying a few chickens over on the non-rainy days to let them have a go at all the yummy greenery. They aren’t too sure about it and spend most of their time hanging out by the fence line. Today I had a Bob escape from the garden and walk her way back to the chicken pen. I guess she didn’t like the fresh greenery (or change). We are thinking about moving the chicken coop over to the garden for awhile. That would give their pen a chance to spring back. Lee told me that some skids are planned for the bottom of the coop soon. Lynn here is a picture of Elwood and Jake for you. It will be neat to see what colors you wind up with. Elwood is the one that has a muff around his face. Jake never grew one. They are the two far right chickens. Here is a picture of Elwood that I got a while ago. It’s the only one I have that I managed to get a good full on of his muff. Love the chicken pictures. I find your hens so very entertaining! Robin! I love the chicken pics- Thanks so much! Jake & Elwood are absolutely beautiful – at least I think so! Their colors are so vibrant. I hope our little guys & gals grow up to be so pretty & big! Right now ours are so scrawny – they are losing their down, but haven’t quite gotten the feathers fully in… it’s a very ugly, scrawny stage. How many roosters do you have – I tried to count them in the pics – it looks like alot of roosters, but I can’t tell! Lynn- Yeah, that scrawny stage isn’t the cutest. I remember getting really excited when they started getting all their feathers in and stopped looking so rough. We don’t have any roosters. I was actually a little disappointed as I wanted at least one. The Barred Rocks and Rhode Islands Reds have a single comb, the Araucanas have a pea comb, and Wyandottes have a rose comb. The single combs sometimes makes people think they are boys because of being bigger. Our chicken pen is roughly 80 feet by 80 feet. But you have to remember that most of it is under trees. 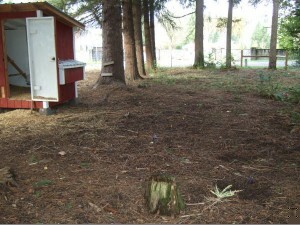 So there wasn’t as much vegetation to start with as an all open grass pen. Lynn – A local free-range egg producer, Robert Plamondon, is my favorite reference for this sort of thing. He says that anything beyond 80 chickens per acre will exceed the soil’s capacity to handle the nitrogen waste, and eventually end in a bare dead lot. He suggests 50 per acre to account for non-uniform use of the land, so our 6400 sq-ft pen is only good for about 8 chickens. Unfortunately, our pen is mostly tree-covered, which reduces vegetation and chicken ranging further. 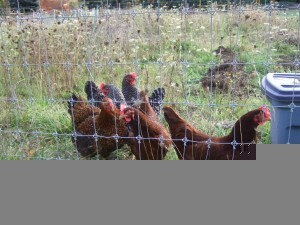 Our plan is to move the chickens, perhaps every 6 months, to prevent damage to any site in particular. For more details, you can check out Plamondon’s page about range requirements. He also gives a good summary of what “free range” really means in store-bought eggs and meat.